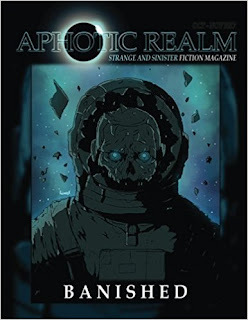 To celebrate the launch of Aphotic Realms second issue; Banished I 'm talking to Chris Martin one of the many uber talented authors featured in this magazine. 1) Hi Chris thanks for joining us today, tell me how long have you been writing for? I have been writing off and on for almost 10 years. Only recently have I focused my attention and declared a goal for myself. 2) What draws you to horror? Do you remember the first horror story or film that you first encountered? I can't say anything particularly draws me to horror. I enjoy any story that allows me to escape to another place and time. Experiencing the story through the eyes of the character is a must. The first horror movie I ever watched was Poltergeist. First horror book was IT by Stephen King. 3) Do you have any upcoming projects? I'm assisting with the editing duties at Aphotic Realm for the General Website submissions and prepping for the next 3 magazines. I've also officially begun work on a novel of my own work. A follow up or partnering story for Far From Home will be written for one our upcoming magazines as well. 4) In your story, Far From Home, would you rather have the awesome physical strength of Kovic or to have magical powers like Alfric? This one is hard for me as these two characters aren't very likeable, even for me and they're my creations. Admittedly, I would have to go with physical strength. It fits more with who I am. Magical power can be too easily manipulated for nefarious purposes I believe. Chris Martin grew up in rural Alabama. As a fan of all things Star Wars, Transformers, Tolkien, and the like, many days were spent either pretending to be his favorite characters alongside his brothers romping around in their backyard, or reading his father’s comics. 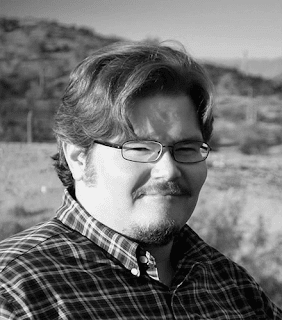 As he grew older, his love for fiction began to encompass novels of the same genres. His father introduced him to the realm of high fantasy through The Hobbit, The Lord of the Rings, and Dungeons & Dragons. It was through the love of Dungeons & Dragons that Chris Martin discovered his love for writing. As a veteran dungeon master, he has constructed a vast, culturally detailed world that he still leads adventures through to this day. This world is the basis of a series of novels he is currently working on. Chris Martin now resides just outside of Phoenix, Arizona. When he isn’t slaving away at his day job or relishing his time as an adopted grandpa, he enjoys long, epic D&D sessions with his friends. When AR brought him on, we posted an interview to help get to know him. Check out his interview here.